Riga, Latvia’s capital, lies at the mouth of the Daugava River, close to the Baltic Sea. Founded in the thirteenth century by the Germans the city came soon became part of the Hanseatic League, and became an important trading port on the Baltic. 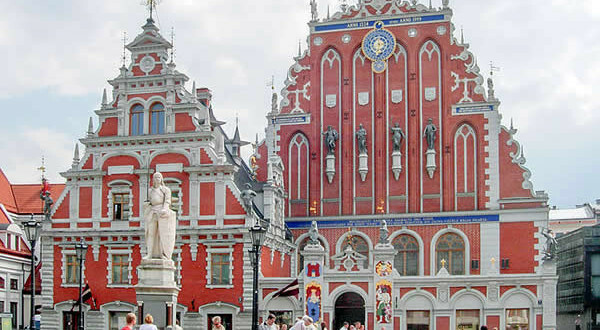 Riga belonged to the Knights of the Teutonic Order and in the seventeenth century became Swedish, in the eighteenth century it was conquered by the Russians, who made it one of the the most important ports in the country. The historic center of Riga is part of the UNESCO World Heritage sites, and right in the historic center of Riga – during the weeks of Advent – Christmas market takes place, the scene of the marketplace is the Cathedral Square. Even the city of Riga, such as the nearby city of Tallinn claimed the birth of the first Christmas tree, it seems that in Riga for the first time in 1476 was decorated a Christmas tree. 1) Riga Christmas Market (Vecrīgas Ziemassvētku tirdziņš). The Christmas market is held in the historic center of Riga, in the cathedral square, and lasts until Orthodox Christmas. The stalls exhibiting fine craft pieces such as candlesticks in Latvian wood, Baltic amber jewelry, silver jewelry, gloves, hats and scarves, scented candles, wool socks, wooden toys. Among the delicacies of the market: mulled wine, toasted almonds, Latvian honey, gingerbread, hot tea. Among the events related to the market you will find concerts of Christmas carols and traditional Latvian songs, and for children the post office of Santa Claus. Opening Hours: open every day from 10am to 8pm (Fridays and Saturdays it closes at 22.00). On 24 December from 10.00 to 18.00. On 31 December, the market is open from 10am to 2am.